Did you know that Imani Coach was started in the year 2011 with a total of four Isuzu buses.? The Company began with the Chiakariga - Mombasa route where it was dominating the route and winning the hearts of many. Imani further with time expanded its route and started Meru - Mombasa route where it was crowned Route King, Mombasa - Nairobi, Mitunguu - Mombasa among other routes. Imani Coach is now among the best upcoming bus companies in Kenya with different bus fleet including the famous UD's and the Scania beasts that provide luxurious and comfortable travel to various Imani destinations. The bus also have reclining seats with enough legroom, charging sockets and LCD screens for maximum entertainment while onboard. Imani coach will soon start its new Isiolo - Mombasa route among which its best buses will be used to ply the route. 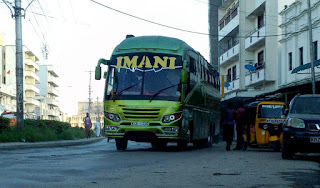 To make bookings/reservations with Imani coach, visit any Imani Coach near you and enjoy the most affordable bus prices. Bus Kenya, We Will Take You There..